St Anton is a top holiday resort destination for British skiers and snowboarders, attracted by both the first-class skiing and the fun, beer-fuelled après-ski sessions. Along with its neighbours, Lech and Zürs (only a short bus ride away), St Anton offers extensive skiing for intermediate skiers but is possibly not the best choice for beginners or non-skiers on holiday as lower slopes can get crowded and there are not many off-slope facilities. 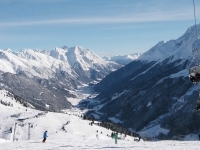 The St Anton holiday resort, which sprawls along the bottom of a narrow valley, is a haven for ski-bums attracted by the excellent off-piste runs - some of the best Austria has to offer. St Anton's south-facing slopes can get slushy by the end of the day, particularly in spring, and partly for this reason the collection of bars on the slopes above St Anton get packed by around 3pm. St Anton is the largest holiday resort in the Arlberg ski area, which also includes Lech, Zurs, and the village of St Christoph and St Jakob. The combined Arlberg ski area offers hundreds of miles of groomed runs and ski trails for skiers and snowboarders. The most prominent point in St Anton is the Valluga summit from which runs one of the best and longest intermediate ski slopes in Europe, taking skiers all the way down to the valley floor. There are many more choices for intermediate skiers on holiday in Lech and Zurs, which also offer some of the best off-piste skiing in Europe. It's not easy to ski from St Anton to Lech or Zurs and most people take the bus, which leaves regularly from the town centre. Due to their north-facing slopes and position at the end of the valley, Lech and Zurs offer reliable snow and comparatively uncrowded slopes. The best skiing for beginners is in St Christoph or Rendl. There are two ski schools in operation, run under the same umbrella, both employing hundreds of instructors and guides with a solid reputation for excellent tuition and service. St Anton is also known for having some of the best snowboarding terrain in Austria, with a vast array of natural obstacles, steep powder fields, and drop-offs providing thrilling free-riding. Gampen, Kapall, and Rendl are recommended for boarders and Rendl has a terrain park. Shopping along St Anton's pedestrianised main street is a holiday must and quite laid-back, with plenty of cosy bars and cafés where shoppers can rest their feet. St Anton's shops tend to be expensive but the quality of merchandise is good. There are numerous ski wear and ski equipment outlets stocking top brand goods, as well as good jewellers, music stores, antique stores, and clothing boutiques. It is well worth checking out the local arts and crafts work while on holiday in St Anton, particularly traditional woodcarvings. Dining out while on holiday in St Anton is a diverse and satisfying experience, with everything from burgers to vegetarian meals on offer at establishments that keep cooking until well after midnight. For five-star dining in St Anton, try the luxury hotels like Raffl's St Antoner Hof or Alte Post. Active skiers wanting a hearty meal seek out traditional Austrian fare. Some of the best in St Anton is served up at the Sporthotel, where a variety of sausages can be savoured with an accompaniment of potatoes and sauerkraut, all reasonably priced. Game and dumplings also appear on most St Anton menus. Fondue can be enjoyed at the Montjola, one of the oldest restaurants in the area. The club and bar scene in St Anton is very lively, and less expensive than some of the other European ski resorts. The 'in' places while on holiday in St Anton are the Krazy Kanguruh Bar on the mountainside, and the MooserWirt Bar, both usually packed with skiers and snowboarders after a day on the slopes. Alcohol flows freely to the tune of rock and hip hop in St Anton. The night is long at the numerous other discos and clubs, but for those seeking something more sedate there are quieter, more sophisticated bars in the St Anton hotels. Skiing, snowboarding, and partying are the main activities on the holiday agenda in St Anton, but the town does offer some vacation alternatives. The Arlberg Hotel is a venue that offers spas and swimming facilities, and there are indoor sports facilities for racquetball, bowling and tennis. A unique open-air heated pool on the wooded mountainside, with a playground and waterslide, is extremely popular in the summer. St Anton's south-facing slopes can get slushy by the end of the day, particularly in spring, and the lower beginner slopes can get quite crowded.